Updates below. In about an hour, Tawn and I will drive to Central Chidlom, one of the most prestigious department stores in Thailand. We will arrive just as the store is closing for the night and in less than eight hours, with the help of a contractor and his crew, will install his first boutique. The previous occupant of the space will be moved out and their decorations demolished in less than two hours. 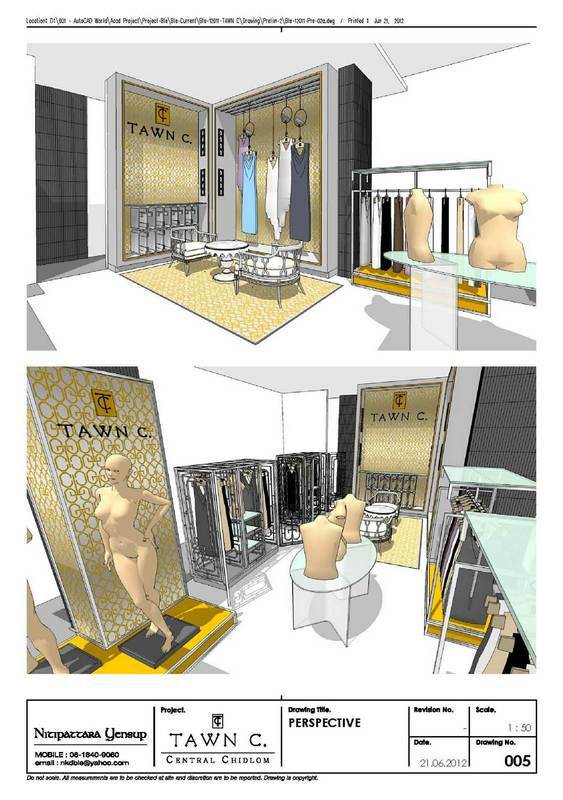 The remainder of the night will be spent installing the decorative items, shelves, display cases, lighting fixtures, and all the other pieces needed to create the retail space and project the Tawn C brand image. 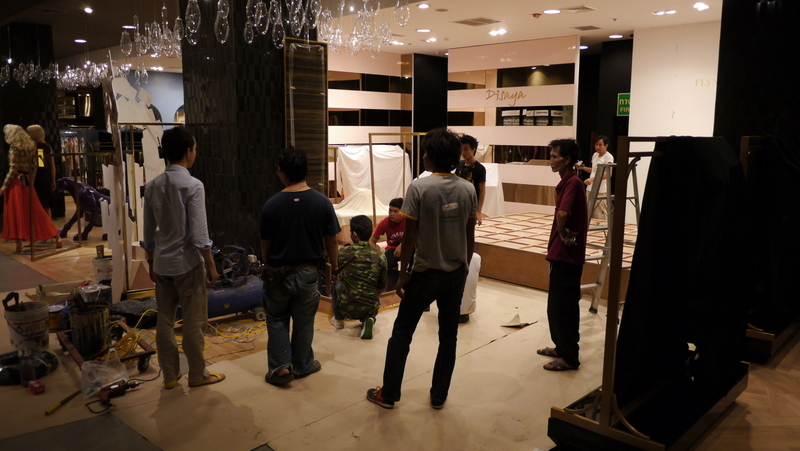 Our friend Ble, a well-known interior designer here in Bangkok (he also designed our condo’s remodel) did the shop design and will arrive at 6:00 am to help with the final styling before the 10:00 am opening. It will be a long night, but it is exciting to see two years of hard work finally turn into something real. Now, let’s hope we can turn it into something profitable, too! Am back at home for a little bit after a night at the department store. Some moving people are supposed to show up in ten minutes to pick up some chairs from our living room. The chairs will be used in the store until the correct chairs that our designer ordered, arrive. The deinstall of the previous tenant’s decorations ran late because of some stone tiles adhered to one wall. We insisted that they needed to be removed because the dimensions of our cabinetwork would not allow for that extra two centimeters of thickness on the wall. 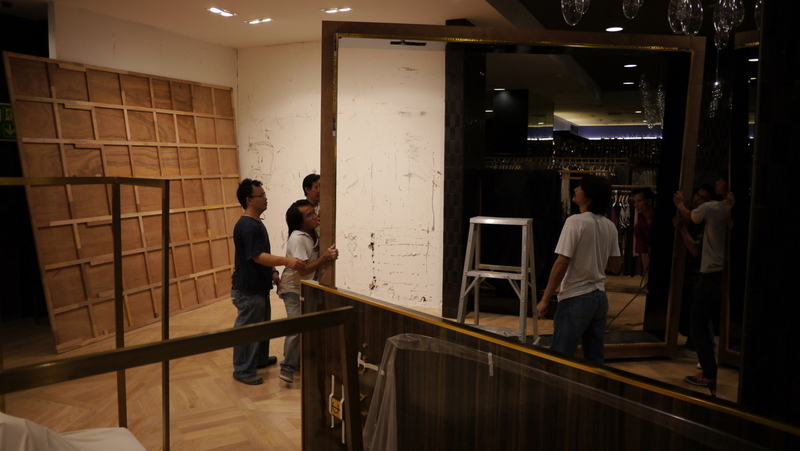 By 12:30, our workers started carrying cabinetwork into the space and assembling it. After taking pictures of the crew installing the paneling on the front column, it occurred to me that it was facing the wrong way: it should be turned 90 degrees clockwise so the short panel that is visible in this shot faces the left of the picture. Tawn brought this to the workers’ attention and they eventually moved it. Then they discovered that due to incorrect measurements, the front riser on which mannequins will stand is five centimeters too long and intrudes into the aisle. The workers focused first on installing the rear cabinetwork and, once complete, turned their attention to resizing the riser. The mirrored borders were installed last and the worker was polishing them and peeling off the protective layer of plastic on the laminate. 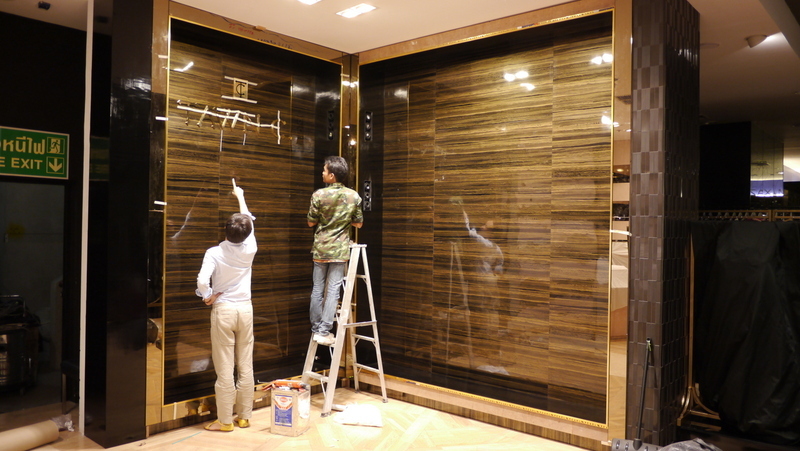 Just before leaving the store – about 4:30 am at that point – the workers had disassembled the riser and were manually cutting it (and the metallic edging) to size with a hacksaw. Tawn warned them that the quality of work had to be perfect. We’ll see how that turns out! After the movers take the chairs, I’ll drive back to the store with some items that the designer and Tawn can use to dress the store. What time do the coffee shops open? This entry was posted in Uncategorized and tagged central, Chidlom, Designs, Store, Tawn, TawnC by christao408. Bookmark the permalink. How Exciting! Wishing for the best for you both. Oh my god, I’m so happy for Tawn! I am amazed at the things he’s done – it’s so impressive. I also wish him a very successful launch and all great things for his brand I can’t believe the little time you guys have in setting up Tawn’s boutique! I’m sure the launch will be an adrenaline rush to keep you two awake. All the best!! All the best to Tawn in his new venture! I hope everything goes well tonight setting up the store – good luck. Wow, Central Chidlom, that’s right near the central business district, excellent location! It’s has easy access from all those skybridges and skytrains around it.All the best to Tawn’s new venture! I can’t wait to visit his store on my next visit to the Big Mango! well by now things are settling. i hope to see photos when it is done! Best of luck to Tawn in his new boutique. I trust he will be very successful. He has an energy about him and the love for his craft will take him far. You must be very proud. Congratulations to Tawn! How exciting you both must be! Best of luck! All the best to Tawn. From what I seen here of his designs, he will do well. Lot of hard work. Now relax and enjoy the praise. Congratulations to Tawn – fantastic ! I look forward to visiting his boutique next time I am in Bangkok. Central Chidlom is one of my favorite shopping location. Very exciting – congratulations to you both! Best wishes, good luck, break a leg — what does one say to a designer launching a line? All of those, anyway! So much to do and so little time! This is wonderful and exciting news – Congratulations to Tawn and all hopes for a successful venture!! A night Tawn will always remember. There’s so much work to do in opening a store and many more headaches & challenges to keep it going. Despite some glitches, you folks look like you have things under control. I hope you’ll be able to stay awake for the grand opening. Best wishes for a prosperous store and a healthy balance sheet. Awesome! I am sure it was/will be hectic. All the best to Tawn. I can’t wait to read the next part about how the opening of the place went and how well Tawn’s collection was received. Exciting! It sounds like one of those stressful adventures that also brings a great sense of pride and accomplishment. Good luck, Tawn! And good coffee to you, Chris! @christao408 – Hah! I hope not! It all sounds so hectic. I hope it all came out well and that the opening is a big success! Very exciting indeed for both you and Tawn. wow, i’d like to see the final product! that’s crazy that it was an overnight transition like that… hope you found some coffee! @slmret – Yeah, I was trying to come up with a clever one, but failed! D’oh! @fuzzynavel – Yes, yes… thanks! @rudyhou – Will be sure to share it soon. Plus, you’ll see it when you come to Bangkok, right? @secade – Thanks, Colin. Everything opened alright but Tawn has had to spend the last three nights at the store working with the cabinetmakers, who continue to fix problems like poor quality lamination, missing mirrors, etc. He’s exhausted! This is so exciting! I’m pretty sure I visited that during my brief stay in Thailand two years ago. Congratulations and hope everything went smoothly on launch day!